Wow. Another Money 2020 in Vegas. A peculiar combination of exhaustion and exhilaration. Days of back-to-back meetings, serendipity, dinners with old and new friends, learning and (why would I lie to you?) a few drinks and a few hours of blackjack. Back in the land of signing for card transactions, ready to explore the future of financial services. 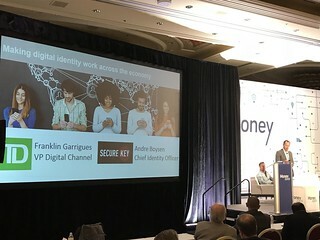 Last year, I said that all the interesting stuff at Money20/20 was actually about identity and that all of the fintech stuff would have less impact than all of the regtech stuff. I still think this is true. Fintech has become mainstream, there’s no doubt about that. There was a lot of corridor talk (they don’t have water coolers and I couldn’t find the free ice cream) about how the fintechs are integrating with the key players (as if the mammals interbred with the dinosaurs rather than replaced them). The fintechs aren’t what the incumbents were really worried about. What they were worried about (other than regulatory change) were the strategies of the Google-Apple-Facebook-Amazon-Microsofts (GAFAMs) and the Baidu-Alipay-Tencent (BATs) and that (as we will return to later in this discussion) is because of the fight for data. Perhaps I’m reading too much into coincidences of scheduling, but it seems to me that Sunday is being used to explore new topics and then in the following year some of those topics move from the experimental or exploratory sphere into the mainstream discussion. 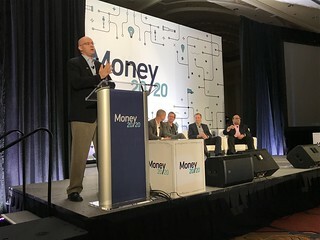 Last year at Money20/20, for example, I chaired the session on financial inclusion with Professor Lisa Servon and this year I couldn’t help but notice that financial inclusion reappeared in a number of mainstream panels and presentations, including in the superb Monday keynote from Dan Schulman of PayPal. So, if financial inclusion was making its way from the edge to centre last year, there is no doubt that it was artificial intelligence playing that role this year. 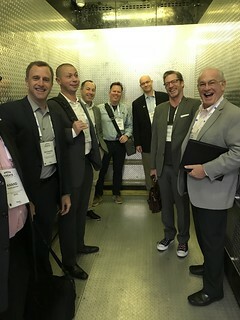 I chaired the artificial intelligence panel at Money20/20 Europe in Copenhagen this year and it was absolutely stormed. 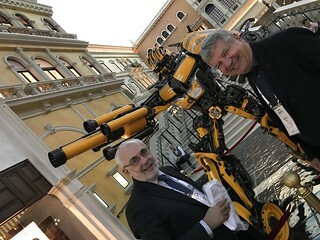 In Vegas, I heard many, many people say that the AI discussion on Sunday was first rate and left them in no doubt that it would be the key mainstream topic next year. The money going into AI is already huge and if you look at where banks are directing the cash right now, machine learning seems to be the target. This is no surprise. Banks have large quantities of data that in the past they have found difficult to extract wisdom from and they have large transactional flows that they find it difficult to manage in the context of increasing regulatory burdens. Machine learning systems excel at finding patterns and exceptions in such data, provided that they can be fed with enormous quantities of the raw material, so the main use of the machine learning systems is currently fraud detection and prevention (DBR Research, October 2017). The impact is not only on retail banking. The Bank of England’s recent working paper (no. 274, September 2017) on machine learning at central banks explored the particular case study of banking supervision in an environment of imperfect information (what you and I would call “the real world”!) and came to very optimistic conclusions. In other words, AI is not only a fintech that can help individual organisations to shift improve profitability (both by reducing costs and increasing revenues) but also a regtech that can help jurisdictions to create better financial services sectors by improving the quality of regulation at lower cost. 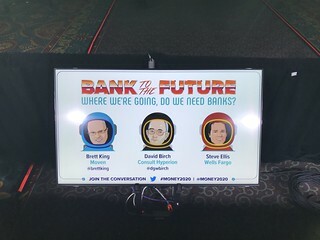 On Monday I was up on the main stage where I had the privilege and pleasure of moderating the debate between Brett King of Moven and Steve Ellis of Wells Fargo. They are both great guys (and I’m not just saying that for form) and they made it fun for me and for the audience. Wells Fargo put Steve’s perspectives on their web site so you can read them here. As an aside for future conference organisers, I thought this was a great format because both of them made serious and substantial points – someone told me later that he didn’t realise how much his was learning during the debate! – but in an engaging structure that help to wind the day down. Big props to Money20/20 for this idea. Several people said that what stuck out for them on the Monday was the difference between the Alipay keynote, which was all about the colossal numbers and opportunities, and the ApplePay keynote, which conspicuously failed to include any usage numbers. Now, as we’ve long maintained, this doesn’t really matter because the long-term play is #appandpay not #tapandpay, but there was certainly as suspicion abroad amongst uncharitable persons (of whom I am not one) that ApplePay’s usage at retail POS may be underwhelming at a time when negotiations about renewal contracts with issuers are on the horizon. Jennifer Bailey of Apple also mentioned the coming Apple Cash (which will allow P2P payments via iMessage or whatever it is called now). I don’t know enough about the US market, but I would have thought that in the European markets they will implement API access to bank accounts with access to instant payment networks and that this will come to dominate across platforms, but I wouldn’t bet against Apple on anything as a rule. 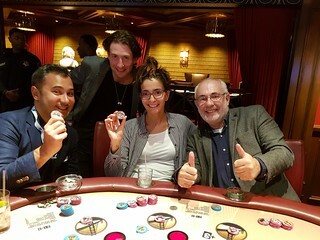 Anyway, enough of that, let’s go play blackjack with some crypto-folks because they have all the money. On Tuesday, Talking about inclusion, again, Kosta Peric from The Bill and Melinda Gates Foundation was in town. I went off to have a chat with him to find out all about their new open-source software for the unbanked, Mojaloop. This uses technology from Ripple to deliver interoperability between financial institutions, payment providers and other firms that offer such services to the poor and unbanked. (It uses the Interledger protocol.) This all came out of the Gates Foundation’s Level One Project, which Kosta has championed, so I was keen to understand the roadmap and how it might connect to some of our work in inclusion. Unfortunately, as so often happens, we got sidetracked by giant killer robots. Last year’s general talk about blockchain this and blockchain that was less in evidence, although with Bitcoins at $6,000 there was a fair amount of cryptocurrency talk (and misunderstandings) swirling around. The blockchain discussions were more focused (there was a good panel on blockchain consortia with JP Morgan, R3, Microsoft and Hyperledger) and I thought there was less of the crazy talk about blockchains fixing everything, although it did continue to irritate me that most of the solutions being discussed were not actually blockchains at all but shared ledgers (and before anyone writes to complain, I refuse to call them distributed ledgers because in at least one example that I discussed there, there was only one node and no consensus algorithm at all). The big difference from last year was that the main topic of discussion in the crypto space was the token/ICO gold rush. 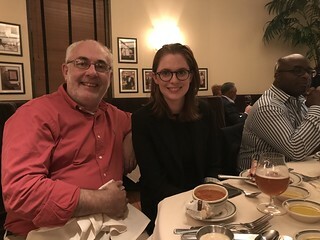 Consult Hyperion hosted a couple of dinners for friends and clients in Vegas and at one of them Arthur and Kathleen Breitman, the people behind one of the highest profile token raises of all (Tezos, now worth more than $400m), came along. Now, I am far from being an expert on the subject, but I genuinely think that when the token/ICO market is regulated correctly (and that must come soon) it is going to be absolutely massive, because it will create a new asset class and (I hope) a new and more transparent marketplace. I might even go so far as to say that it might be one of the most important long-term outcomes of the Crash. There were a couple of other themes that caught my attention wandering in and out of the conference sessions. Conversational commerce, and therefore conversational payments, is on the rise. Facebook was there, as were other players, and I definitely picked up more buzz about chat and chat bots. Although I didn’t hear it discussed at the event, it seems to me that there is a strong relationship between conversational commerce and the impending shift to Open Banking in the UK. Giving, for example, Facebook API access to your bank account means that you’ll be able to check your balance, look at your transactions, send money to people all without ever leaving WhatsApp. What’s more, given the amount of payment fraud in the UK, this is probably really good news. If your lawyers continue to use e-mail instead of Signal for house purchases, they are borderline negligent. Considering it was the early morning of the last day of the event, it’s a testament to the intuition of the organisers and the quality of this panel that the ballroom was full. I thought that identity would be a key topic, and I expected a reasonable turnout, but I was surprised to find a full room with people standing at the back when I walked out on stage. I’d like to think that it’s mainly down to Consult Hyperion’s reputation at the forefront of population-scale identity projects (going all the way back to the days of the world’s first smart identity card in Hong Kong), but I think the size of the audience also reflects just how high up the bank agenda digital identity is now. We divided the workshop into two parts. The first section was about authentication, and Brett McDowell from FIDO Alliance MC’d with input from Intel, Javelin, Diebold Nixdorf and Samsung. I thought these guys delivered a very positive message. Not that things are fixed, but there is at last the potential to fix them. As panelist Al Pascual from Javelin said earlier in the year, commenting on the news that identity theft and fraud in the US was up 16% this year and is now at the highest levels they have ever recorded, “all of the underlying types of fraud we measure are up”. But with smart phones, biometrics and strong authentication frameworks coming into place, there is light at the end of the tunnel. Perhaps it’s a slight exaggeration, but I was left with the impression that strong authentication for transactions is basically a solved problem if you plan out the system properly. We have the architecture, devices and standards to make it all work. The second part of the workshop was about identification and it closed with a great, great case study. SecureKey and TD Bank took us through the multi-bank digital identity scheme under development in Canada. If the identity workshop wasn’t the most talked about thing on the final day, Barclaycard’s announcement of the Uber Card probably was. I have to say that it is a beautifully executed product. Uber gives customers the option to apply for the card form inside the app and populates the application form from data on file. Once the customer applies, they get confirmation (or otherwise) within a few minutes and can immediately begin charging rides to the new line of credit. A few days later the plastic card arrives in the post. Folks also can apply for the card online. 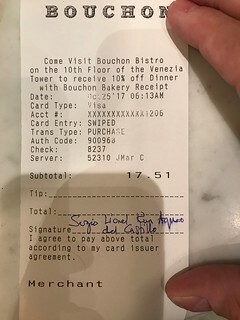 There are some sweet flashbacks to launch the card, including four percent in restaurants, three 3 percent on on hotels, two percent back on online purchases and one percent on all other purchases. No wonder it got such attention on social media. Anyway, after three solid days of this I needed to get away so I took up an invitation to visit the futurist Heather Vescent in her dome at Twenty Nine Palms, which turned out to be in the desert. A perfect way to clear my head and to enjoy a mini road trip involving (as it did) highways and diners. 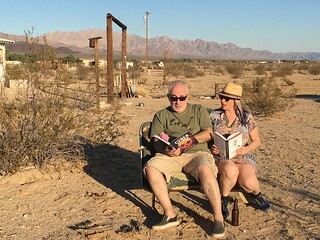 After relaxing and discussing Heather’s new book, the “Cyber Survival Manual“, I said goodbye to the desert and set off back to the daily grind. Thanks once again to the great people at Money 2020 and here’s looking forward to 2018.